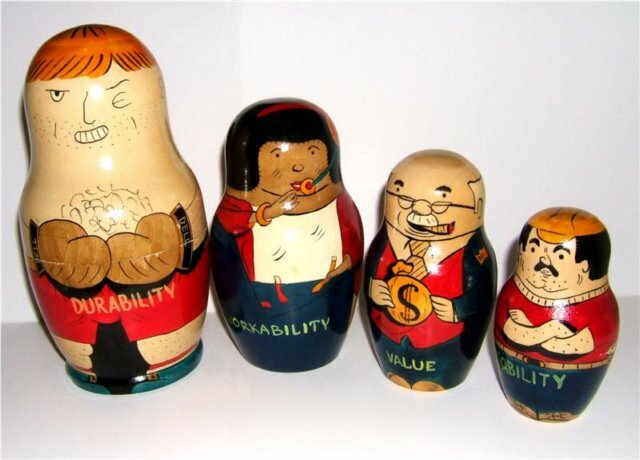 Includes four large dolls: Durability (Boxer), Networkability (Service Rep), Value (Banker) and Stability (Handyman). Each doll says the word “DELL” someone on the doll (boxing gloves, or on the back). The "Stability" doll has a small mark on the back. A label on the bottom says: “Hand made in Russia”. The dolls are somewhat crudely painted, but must have been done as some sort of DELL Computer promotion.